Arlene Jones - Featured Columnist Austin Weekly News: Pray for Obama T-Shirts - KNOW THE PRAYER AND THEN DON'T BUY! 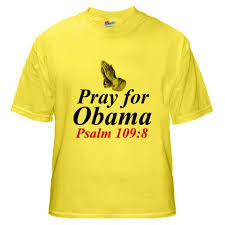 Pray for Obama T-Shirts - KNOW THE PRAYER AND THEN DON'T BUY! their bread also out of their desolate places. to favour his fatherless children. their name be blotted out.